For those who have heard of this personality, but have never had the chance of knowing some details about Kenny Chesney, this piece promises to inform you with the necessary information about him. On the 26th March, 1968, this country music singer, songwriter and record producer of American origin was born. Up to date, he has an amazing number of albums, totalling 20. Out of which, 14 have been endorsed Gold or higher by the Recording Industry Association of America (RIAA). Kenny Chesney is also known to have released more than 40 top 10 singles, among which 29 of them, have attained the first spot on the United States Billboard Hot country songs and Country Airplay charts. 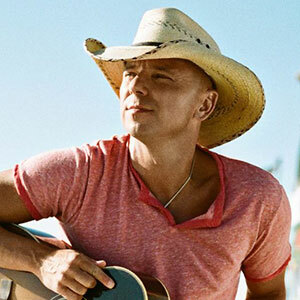 Kenny Chesney is regarded as one of the most flourishing crossover country artists, based on the fact that a good number of his songs have been charted within the Top 40 of the US billboard Hot 100. Currently, he has over 30 million albums sales to his credit. Being birthed at St. Mary’s Medical centre in Knoxville, Tennessee, he was bred in Luttrell, having a mixed descent of English and Irish. His father, David Chesney, once worked as a teacher in an elementary school, while the mother, Karen Chandler, was a hair dresser in Knoxville. Chesney only had a younger sibling, Jennifer Chandler. Chesney wrapped up his high school education at Gibbs High school in 1986, having learnt the basics of Football and Baseball. One Christmas, he got his first guitar, and this marked a prominent point in history for him, he started taking self-tutorials, and with time, he learnt how to play it. Kenny Chesney landed his first recording deal, in what seemed like magic. It happened in 1992 when he was recommended by Clay Bradley, the leader of writer relations at BMI to Troy Tomlinson, his friend who worked at Opryland Music Group. Chesney later had to perform a couple of songs, five to be exact, and Tomlinson was so thrilled. Later that day, Chesney got himself a recording deal. The next year, he got another contract with Capricorn records because he showed up at a songwriter’s show. His first album was titled “In my wildest dreams” which was released in 1994, under the stables of Capricorn records. The total number of album sales prior to when Capricorn records collapsed its branch in Nashville, was few figures shy of 10,000 copies. After this huge success, a good number of albums follow, and back-to-back success was recorded. Concerning collaborations, Kenny Chesney had quite a number. He had a collaboration with one of the personalities which he looked up to, Jimmy Buffett. He also had another with Tim McGraw, Neil Thrasher and Wendell Mobley. Kenny Chesney also worked on a duet with Reba McEntire, the song was featured in her 2007 album, and it made some waves. The album sold more than 2 million copies, and was certified Platinum by the Recording Industry Association of America (RIAA). Chesney has had a bit of a rough life. In 2000, he and a friend, Tim McGraw, had a brawl with police personnel, they were arrested and charged to court. They later got free from the case in 2001. In 2005, he married Renee Zellweger who happened to be an actress. That same year, just four months after their wedding, they made an announcement stating plans to dissolve their marriage. Forbes in 2015, assessed Kenny Chesney’s annual income to be $42 million. Chesney has done a bit of Philanthropy, as he assisted the victims of the U.S. and British Virgin Island, who were affected by the Hurricane. He founded a charity fund, and contributed all the earnings he got from SONGS FROM THE SAINTS.